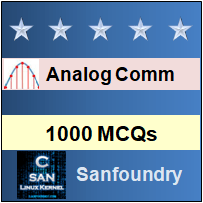 This set of Analog Communications Multiple Choice Questions & Answers (MCQs) focuses on “FDM System”. Explanation: WDM (Wave Division Multiplexing) is partly similar to FDM (Frequency Division Multiplexing). FDM is used for signal transmission through a twisted-pair cable while WDM is used to transmit signals through optical fiber cables. Frequency difference between WDM and FDM is infinity. Explanation: FDM stands for Frequency Division Multiplexing. The total bandwidth is divided into a series of non-overlapping frequency bands and each band is used to carry a separate signal. Explanation: TDM stands for Time Division Multiplexing. It is used to transmit and receive independent signals over a common signal path with the help of synchronized switches. 4. TDM and FDM are used to multiplex multiple signals into a single carrier. Explanation: Multiplexing is the method of combining two or more than two signals into one, in such a way that each individual signal can be retrieved at the receiver. Both TDM and FDM are used to multiplex different signals into a single carrier. However, TDM is used to transmit and receive independent signals over a common signal path with the help of synchronized switches. Whereas, in case of FDM, the total bandwidth is divided into a series of non-overlapping frequency bands and each band is used to carry a separate signal. 5. What is Synchronous TDM? Explanation: TDM is a method of putting multiple data streams in a single signal by separating the signal into many segments, each having a very short duration. Each individual data stream is reassembled at the receiving end based on the timing. Synchronous TDM gives exactly the same amount of time to each connected device. It allocates time to every device even if a device has nothing to transmit. Explanation: Frequency Division Multiplexing (FDM) is a networking technique in which multiple data signals are combined for simultaneous transmission via a shared communication medium. FDM uses a carrier signal at a discrete frequency for each data stream and then combines many modulated signals. FDM is used to multiplex multiple analog signals. FDM is applied when the bandwidth of the link is greater than the combined bandwidth of signals to be transmitted. 7. Frequency Division Multiplexing (FDM) is based on orthogonality. Explanation: Frequency Division Multiplexing (FDM) is a networking technique in which multiple data signals are combined for simultaneous transmission via a shared communication medium. FDM uses a carrier signal at a discrete frequency for each data stream and then combines many modulated signals. Orthogonal frequency division multiplexing is used to encode multiple carrier frequencies. It is mainly used for latest wireless telecommunications. 8. Which multiplexing technique transmits digital signals? Explanation: Time Division Multiplexing is used to transmit digital signals. FDM and WDM techniques are used to transfer analog signals. WDM (Wave Division Multiplexing) is partly similar to FDM (Frequency Division Multiplexing). FDM is used for signal transmission through a twisted-pair cable while WDM is used to transmit signals through optical fiber cables. Explanation: TDM is a method of allowing multiple data streams in a single signal by separating the signal into many segments, each having a very short duration. Each individual data stream is reassembled at the receiving end based on the timing. Synchronous TDM gives exactly the same amount of time to each connected device. It allocates time to every device even if a device has nothing to transmit. Thus, Synchronous Time Division Multiplexing is used to provide constant time delay. It can also provide constant bandwidth. 10. Time Division Multiplexing (TDM) is based on orthogonality. Explanation: Both Frequency Division Multiplexing (FDM) and Time Division Multiplexing (TDM) are based on orthogonal multiplexing. Orthogonal multiplexing is a method of encoding digital data on multiple carrier frequencies. Explanation: Distance is directly proportional to packet size. So as distance increases packet size also increase. 12. If 32 equally probable events exists and we have to select one of them, number of required bits is? Explanation: 25 = 32, so number of bits required is 5.